Whether you love or loathe cooking, one thing is for sure – the hardest thing about it is coming up with what to cook for each day of the week. Many of us have tried making weekly menus but failed to stick to them with all the leftovers, night eating, and simply not really craving what is planned for that day. Still, even if you don’t mind planning your meals, it takes a lot of time to discover new recipes that suit your taste and it always seems easier to cook the meals you are used to, which is a safe way to get stuck in a rut and eat the same dishes over and over again. Finally, if you are more creative than we are and always think of new recipes you would like to try out, it can prove hard to find the best, highest-quality ingredients that are the starting point of every great meal. This is where Sun Basket comes in. Our Sun Basket box is here, on time and in good shape, with just the slightest dent in the corner. Sun Basket is a subscription-based meal kit service that delivers chef-crafted recipes and fresh, mostly organic seasonal ingredients. It allows you to cook and eat something new every week without spending time on grocery shopping and meal planning. What makes Sun Basket universally appealing is the fact that its recipes are easy to follow and its ingredients are pre-measured, which makes cooking a lot more fun and eliminates the unnecessary waste. It kind of makes you feel like a superstar TV chef, with all the ingredients measured and laid out for you so you can just put on a smile and get cooking. 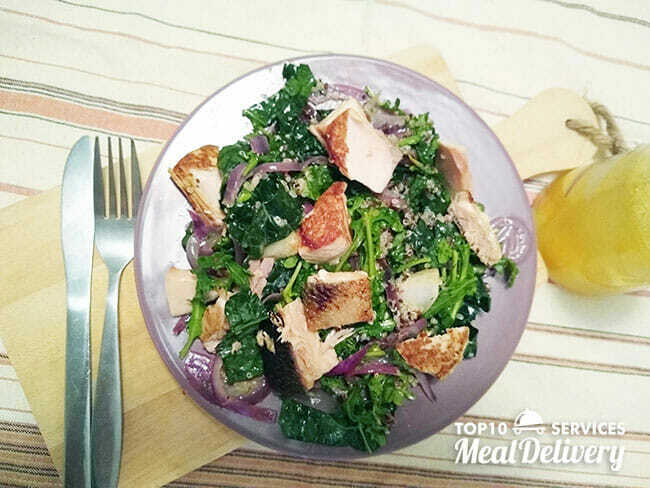 Salmon salad with quinoa and Dijon dressing – 18 minutes to make and looks just like in the photo! In an effort to satisfy the diverse needs of its health-conscious patrons, Sun Basket continuously expands its menu and devises new meal plans that suit all the most popular diets. It offers everything from vegan to Mediterranean options and lets you choose from more than a dozen unique recipes every week. The best of all is that cooking a healthy and tasty meal with Sun Basket can take mere minutes and requires no advanced cooking skills. You just need the most basic of kitchen tools and a pinch of culinary enthusiasm. 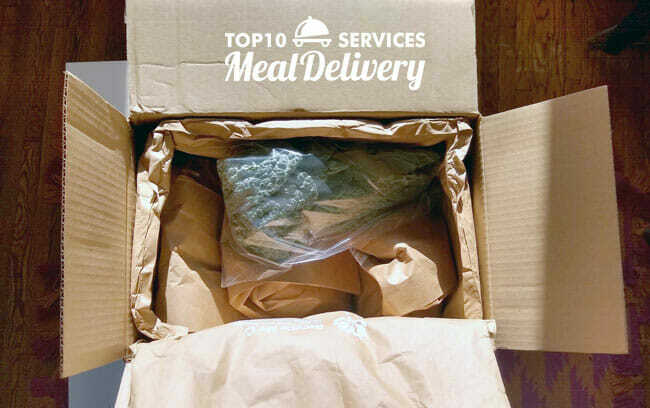 The ingredients are always natural, flavorful, and delivered at peak freshness. Thus, it does not take much to turn them into a mouthwatering delight. 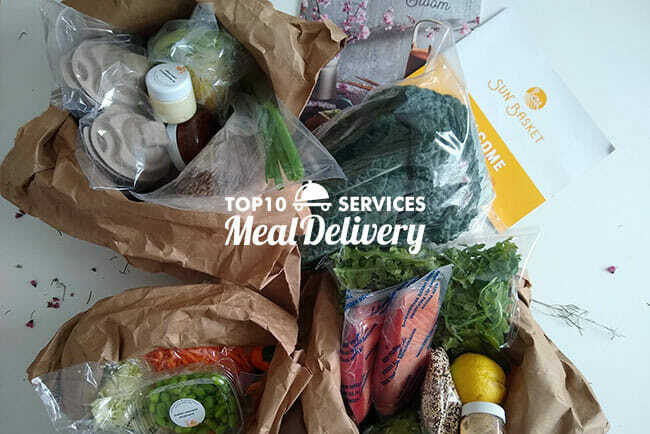 Keeping all these advantages in mind, it comes as no surprise that Sun Basket has long been at the very top of our list of the best meal kit delivery services in the United States. Sun Basket offers 11 distinct meal plans and 18 meal ideas on its weekly menu. You can choose the plan that fits your lifestyle and order 2-4 recipes per week. The recipes are sent to your home, along with the necessary ingredients for 2 or 4 people. You can decide whether you wish to receive your deliveries on Mondays, Tuesdays, Wednesdays or Thursdays between 8am and 9pm. 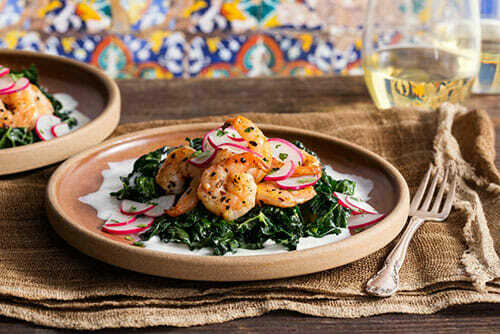 The recipes it offers are crafted by a top San Francisco chef and approved by its in-house nutritionist. Most of the meals take about 20-30 minutes to make. 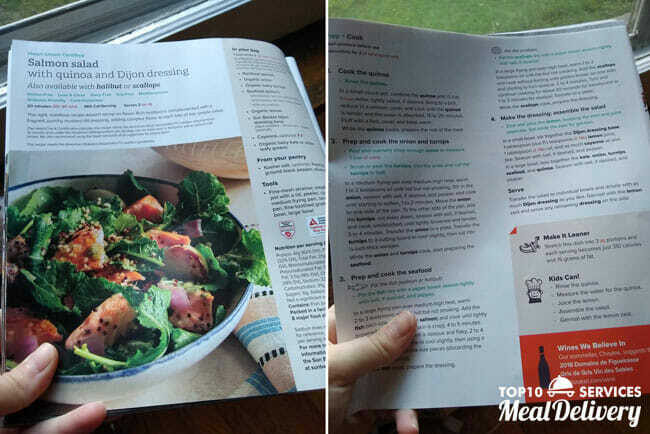 Along with the handy recipe cards, you also get online tutorials, which make the process even easier. The meals contain just the right amount of calories you need to maintain a healthy diet – normally 500-800 calories per serving. Sun Basket has the most detailed instructions we have seen. We feel confident we can do it right. If you like what Sun Basket has on offer and wish to share it with your friends, you can refer them to Sun Basket or send them a gift. If you choose to refer a friend, they get to save $40 on their first order and you get $40 once they join. If you want to send a present, you can purchase a personalized gift card and have it emailed to your friends on the date you select. Your friends get to choose the recipes and delivery dates that work best for them. You can opt for a $100, $200 or $300 gift card or choose a custom value. If you wish to cancel or skip a delivery, you can do it at any time, just make sure to make the desired changes before the weekly cutoff, which is every Wednesday before the scheduled delivery at 12 p.m. PT / 3 p.m. ET. The heart and soul of Sun Basket is its lovely chef, Justine Kelly. Apart from being the former head chef of James Beard award-winning restaurant The Slanted Door, Justine is also a mom who knows what kids need to eat and how to get them to love it. Her inspiration stems from a variety of sources, including restaurants where she dines, her endless collection of cookbooks, and the traditional cuisines of the countries she visits, as well as cooking for her family. When creating recipes for Sun Basket patrons, she makes sure that every dish is a perfect combination of nutrition, inspiration, and flavor. Her skills, imagination, and love for food know no limits and if you read more about her and try out her recipes, we’re sure it will all rub off on you, too. The company works hard on providing only the finest of seasonal ingredients. It cooperates with the best ranchers, fishermen, and farm owners in the country, who know that providing food and treating our planet with respect and care is not an option – but a necessity. The first sight of Sun Basket’s colorful ingredients really put a smile on our face. Everything is organic and this may be the most beautiful kale we have laid our eyes upon. All Sun Basket produce is sustainably sourced and organic. The meat is humanely raised, grass-fed, and free from antibiotics and hormones. The seafood is sourced in accordance with the best practices and the noble mission of the Monterey Bay Aquarium Seafood Watch® program that aims to keep our oceans healthy. The superior flavor of Sun Basket meals is the result of both careful ingredient sourcing and the ingenuity of its culinary team. Apart from the best seasonal ingredients and creative recipes, you also get Sun Basket’s signature sauces and spice blends that elevate the flavor of every dish. With Sun Basket, you know exactly where your food comes from. Proud of the origin of its ingredients, the company provides plenty of information on its suppliers, including exciting videos that allow you to get to know the people behind the food. You can learn more about the unique Hodo Soy’s tofu made of the highest-quality non-GMO soybeans and the sensational spices from Oaktown Spice Shop. You can trace the origin of the seafood on your table back to the environmentally-conscious fisheries that work with the Fishpeople company from Portland. Finally, you can explore the gardens where the delicious organic Sun Basket produce grows, including Lakeside Organic Gardens and Durst Organic Growers. With Sun Basket, you do not have to learn to tell parsley from cilantro or wonder which ingredient belongs to which dish. Everything is clearly labeled and divided by recipe. What we found extremely useful while doing research for this Sun Basket review are the refrigeration tips it offers. Not only do the ingredients it delivers come in insulated boxes which keep the food fresh for 8 hours, but the people at Sun Basket have also taken the time to provide all the information you need to keep the food fresh until you decide to use it. For example, they advise you to put the meat and fish in the freezer if you do not plan to use them until much later in the week and check if there are some veggies or fruit in the bag, like tomatoes or avocados, which should be kept on the counter in order to allow for the ripening process to take place. Sun Basket’s innovative packaging does the trick. The ingredients are optimally chilled and the bags look like they have just been put into the box, no broken seals or damaged bags. Sun Basket is a company that truly cares. It supports local communities through local food banks and employee programs. Its cooperation with Feeding America makes it easy for the company’s customers to donate meals to those who need them the most. By shopping at Sun Basket, you become a part of a community that cares about both people and the environment and does its part in making the world a better place. The company’s website features an entire section on recycling, which further shows how much it cares about keeping our planet green and thriving. Everything used in the process of packing the ingredients is fully compostable and recyclable and all you need to do is follow the instructions for choosing the right bin. Finally, Sun Basket has a great blog with various tricks, tips, and useful information on numerous food-related matters. Sun Basket offers 11 distinct meal plans and 18 meal ideas on its weekly menu. You can choose the plan that fits your lifestyle and order 2-4 recipes per week. Every week, you get to check out what Chef Justine has in store for you next. You can browse through all the recipes or just look at the categories that interest you the most. Her ideas are always delicious and exciting, the photos are breathtaking, and we are sure you will have a hard time picking just three out of all the amazing dishes Chef Justine has crafted just for you. A mouthwatering photo, well-organized steps, and bonus tips at the end ensure you get everything right. Even kids can safely join in on the cooking fun! As a subscriber, you can opt for the Classic or the Family menu. Immense variety or handpicked recipes for picky eaters? You decide and you can change your mind anytime. If you choose the Classic menu, you can decide whether you want to cook for 2 or 4 people. The menu includes 18 delicious dinner options per week, divided into 3 categories: Meat & Poultry, Seafood, and Vegetarian. You get to pick 2, 3 or 4 recipes you want to receive in your delivery. Apart from the dinners, you can also order add-ons, including 5-minute salads, signature sauces and dips, and veggie dippers. There is no limit on the number of add-ons you can order. The Classic menu allows you to choose from 11 meal plans, including Chef’s Choice, Paleo, Lean & Clean, Gluten-Free, Vegetarian, Vegan, Pescatarian, Diabetes-Friendly, Quick & Easy, Carb-Conscious, and Mediterranean. The Chef’s Choice plan brings you the best seasonal recipes handpicked by Sun Basket’s culinary team. All recipes within this plan are optimally balanced, wonderfully flavorful, and perfect for omnivorous foodies who want to try out something new and exciting every week. 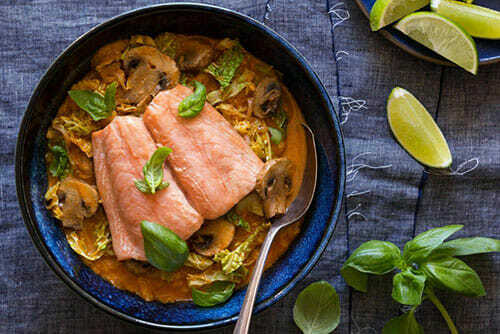 The Paleo plan is designed for people on the Paleo diet, as well as those who want to eat fewer carbs and enrich their diet with healthy veggies and all kinds of protein-packed meat. The Gluten-Free plan is suitable for people allergic to gluten. The recipes included in this plan are just as varied and tasty as the ones included in the other plans, with the only difference being in the absence of gluten. The Lean & Clean plan features recipes that are light yet satisfying and perfect if you want to eat clean and keep your health and weight in check. These recipes contain less fat and fewer carbs and calories. They are rich in fibers and valuable nutrients that keep your metabolism running like clockwork. The meals in this category usually contain around 550 calories. The Vegetarian plan is particularly designed for veggie-lovers. The recipes available with this plan make perfect use of all the flamboyant veggies of the season, farm-fresh, organic eggs, and responsibly sourced dairy. Some of them are suitable for vegans as well. Spicy yuba noodle stir-fry with citrus-miso dressing and mango – a true delight for a veggie lover! We even got some extra mango on the side with each serving! The Vegan plan features incredibly flavorful meat-free dishes focusing on seasonal organic produce. The addition of fresh herbs and house-made signature sauces make the dishes even more thrilling and chef-worthy. The meals normally take between 25 and 40 minutes to make and quite often, you can cook them in a single pan or pot. 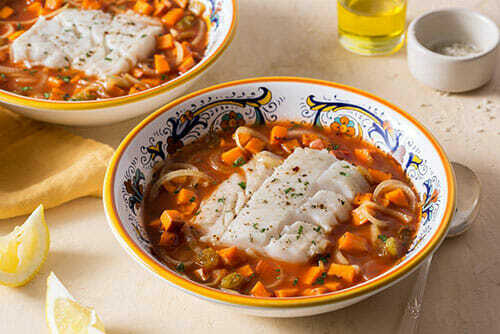 The Pescatarian plan is designed for home chefs who love the vegetarian cuisine and want to enrich their diet with the best omega-3 rich seafood. The stars of all the dishes are gorgeous organic produce and wild-caught and sustainably sourced fish and seafood. The easiest pescatarian recipe we have tried so far and the salmon is a grade above expected. You can taste the quality in every bite. The Diabetes-Friendly plan includes recipes designed with the help of the American Diabetes Association. The recipes are suitable for both diabetics and pre-diabetics. They are calorie-controlled (under 700 calories per serving), carb-controlled (20-100 grams or fewer per serving), and low in added sugars (no more than 10% of total calories). They are rich in fiber and proteins and low in sodium (no more than 700 mg of sodium per serving). The Quick & Easy plan is designed with beginners in mind, but it also works wonderfully for those on a tight schedule. It includes recipes that involve basic cooking techniques, quick prep, and minimum cleanup. Some of the Quick & Easy meals can be prepared in a single pot or pan. The Mediterranean plan is another wonderfully healthy option that allows Sun Basket patrons to dive into the amazing world of the Mediterranean cuisine. The recipes designed for this plan focus on organic produce, lean meat, wild-caught seafood, whole grains, healthy fats, and fresh herbs. The Carb-Conscious plan brings you recipes that contain no more than 35 grams of net carbs per serving and at least 25 grams of proteins per serving. The meals you cook are guaranteed to be rich in omega-3s and other good fats, thus helping you maintain a healthy diet and weight. On average, there are 4 carb-conscious recipes on the menu per week, each containing 550 to 800 grams per serving. What is wonderful about ordering from Sun Basket is that you are in no way limited by your meal plan. 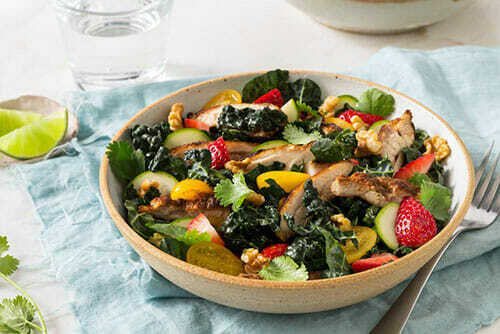 By choosing the Classic menu, you gain instant access to all the recipes on this menu, regardless of the plan you choose, so you can enjoy Chef’s Choice dishes one week, go Paleo the next, and mix and match your recipes any way you wish. The Family menu features 6 recipes for 4 people every week. 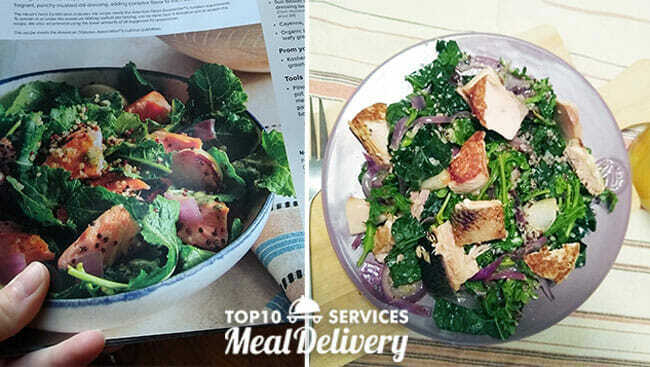 You can decide whether you want to receive 2, 3 or 4 recipes in your weekly delivery. The plans at your disposal include Chef’s Choice and Vegetarian. The recipes available with the Family plans are created with a little help from the famous Chef Tyler Florence of the Food Network. They are 100% family-friendly and everything from the ingredients to the cooking techniques is selected with the needs, appetites, and preferences of the little ones in mind. Just as in the case of the Classic menu, you can choose any Family recipe regardless of the meal plan you choose. Sun Basket and Chef Tyler know how to make kids want to eat their veggies. Sun Basket’s Family recipes are incredibly healthy and their crunchiness and flamboyance appeal even to the youngest members of the family. Both Family and Classic menus are allergy-friendly. Therefore, apart from the gluten-free recipes, you can also find dishes that are free from dairy, soy or both. 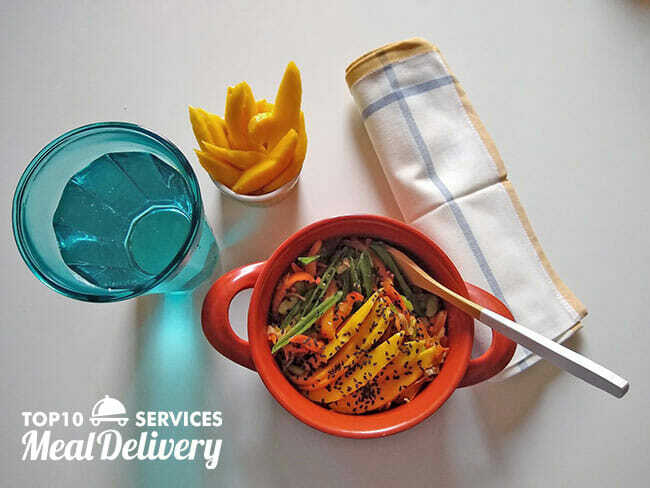 Sun Basket has long been working on transforming its meal delivery service into a personal choice platform. Its goal is to maximize ordering flexibility so your Sun Basket orders always match your desires. You can change your plan whenever you wish and double or triple your order if you are planning a party. You can substitute the meat and fish in your order with the highest-quality offerings, such as jumbo shrimp, wild-caught halibut, organic, grass-fed filet mignon, and New York strip steak. 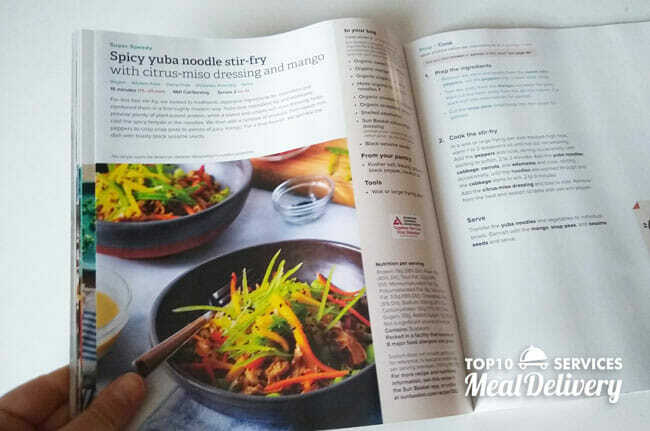 You can choose from a variety of recipe categories, from one-pan wonders to Heart-Check certified meals. The possibilities are endless. Finally, be sure to check out the recipe section. If everything listed in this Sun Basket review has not convinced to give them a shot, browsing through all that delicious goodness will surely make you want to try it all and it will keep you craving for more. Sun Basket meal kits cost between $10.99 and $12.99 per serving. The price depends on the menu you choose (Classic or Family) and the number of recipes you get per week. Shipping is free on your first order. Afterward, you pay a $6.99 fee per box. Now, let us see how much you can expect to pay per weekly delivery. The following prices do not include the shipping costs. With the Classic menu, the price per serving is $12.99 if you order 2 recipes, $11.99 if you order 3 recipes, and $10.99 if you get 4 recipes per week. Thus, a weekly delivery including 2 recipes costs $51.96 if you are cooking for 2 and $103.92 if you are cooking for 4 people. The 3-recipe box for 2 people costs $71.94 while 3 recipes for 4 people cost $143.88. When ordering 4 recipes per week, you pay $87.92 if you are cooking for 2 and $175.84 if you are cooking for 4 people. 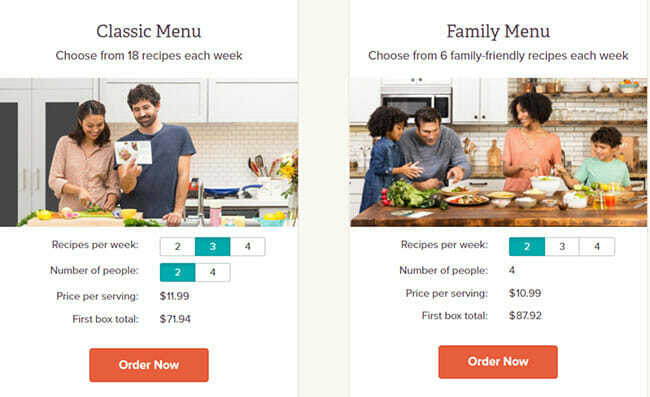 If you opt for the Family Menu, the price per serving is always $10.99 ($87.92 for 2 recipes, $131.88 for 3 recipes, and $175.84 for 4 recipes for 4 people, plus the delivery costs). It is important to know that the company offers a 100% satisfaction guarantee. If you are not happy with the food you receive, you get a full refund. Sun Basket delivers to 47 states within the continental US. At the moment, it does not ship to Alaska, Hawaii, Montana, and parts of New Mexico. The service is constantly adding new areas to its delivery map and may soon become available countrywide. When you order from Sun Basket, you get this adorably designed box. 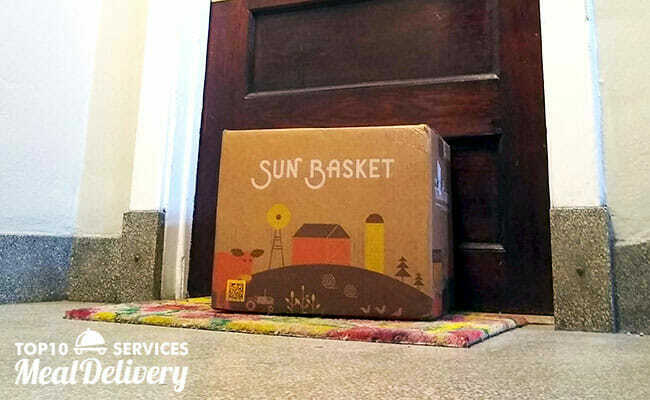 If Sun Basket does not deliver to your area as of yet and you are interested in the service, the friendly folks behind Sun Basket encourage you to contact them via email, so they could work on making it happen. As previously stated in this Sun Basket review, we were a bit disappointed to find out that it does not offer free shipping. Delivery costs are $6.99 for all orders, except for the first week. To make sure Sun Basket meets all your standards and expectations, it is important to know its biggest advantages and disadvantages. 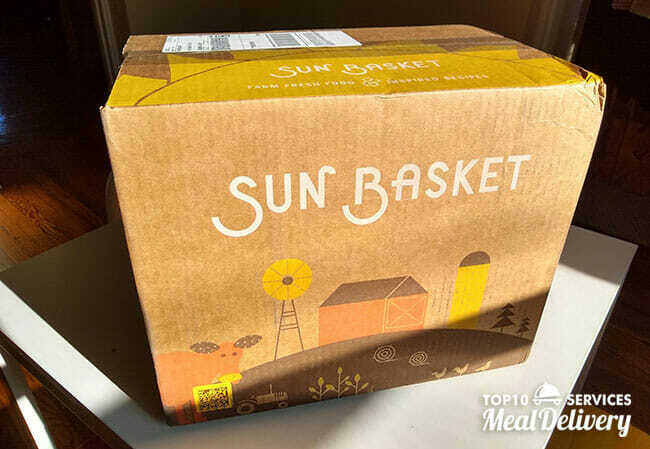 With a short overview of its pros and cons, you can easily decide if Sun Basket is the right meal kit service for you. If you subscribe to Sun Basket, you can easily prepare culinary masterpieces using only the ingredients and recipes found in your meal kit box. You may not be a pro chef just yet, but with Sun Basket, you can easily make restaurant-grade meals. You don’t have to take our word for it – check out the images below to get a better idea of the types of dishes you can enjoy with Sun Basket. Sun Basket’s motto is “we’re not happy unless you’re happy“ and we feel like these folks truly mean it. The recipes the service offers are amazing and easy to follow and the ingredients you receive are fresh, high-quality, organic whenever possible, and sustainably sourced. We were honestly impressed by the variety of recipes and options it provides and we believe that Sun Basket really has something for everyone. 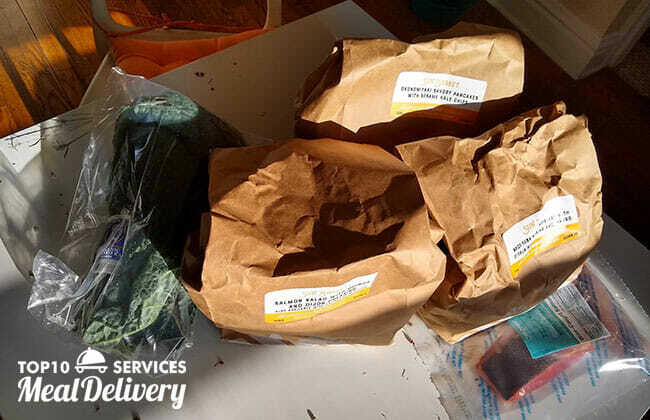 We also have to praise it for being one of the most environmentally responsible delivery services we have encountered so far. Honestly, the only thing we did not really like is that shipping is not free, which increases the price of your deliveries. However, according to the company’s math, with Sun Basket, you save $16.99 on grocery shopping per meal, not to mention all the time you save by ordering from this service. If what you need is more time, less hassle, and always something new and healthy on the table, you should certainly give Sun Basket a shot. How to cancel Sun Basket? To cancel your Sun Basket subscription, you can either contact the company via a toll-free line or log into your Sun Basket account and choose the Cancel My Subscription option. For detailed instructions, please follow this link. 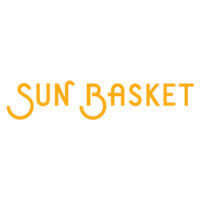 Where is Sun Basket located? Sun Basket is located in San Francisco, California. How long can Sun Basket food stay in the box? The box is designed to keep your ingredients cold and fresh through shipment. As soon as you receive your box, put the ingredients in the fridge. Sun Basket recommends cooking seafood within 3 days and all other meats within 5 days of receipt. When am I billed with Sun Basket? You will be billed immediately after the weekly deadline (Wednesday 12 pm PT/3 pm ET the week before your scheduled delivery day). You will get the receipt the following day. How much does Sun Basket cost per week? With the Classic Menu, you pay $71.94 for 2 persons and $143.88 for 4 persons for 3 recipes a week. With the Family Menu, you can order 2, 3 or 4 recipes a week for 4 people. It will cost you $87.92, $131.88 or $175.84, respectively. The shipping fee is $6.99. More on Sun Basket pricing here. Our ratings are the result of an objective and independent evaluation of Sun Basket, generating the final rating that reflects the overall quality of the company. Ratings may change as the service changes. Sun Basket customer rating based on 90 customer reviews. Look, my wife is afraid to leave me home alone. I had to prove I was capable of survival. This was fun, the food was great and after some reflection this is way better than reading a book to spice up your menu. I have to admit Sun Basket is the first and only meal kit service I’ve tried. I used to order ready-made meals, but I like my food to be real fresh and after a day or two in transport, it’s really not the same as having a meal cooked right before you eat it. As far as I’m concerned, Sun Basket has it all. The recipes are really different and so easy and I like trying out new things, so it really works for me. I liked some recipes more than others, but even with the ones I didn’t love, I could just feel they were healthy, so I enjoyed them anyway. I’ve been ordering for a year and a couple of times, I considered trying another service, but there’s something about having a SB box waiting for me on the doorstep that still makes me feel excited to come home and cook. I have no complaints but one: not all meals are equally satisfying. Sometime, a single portion is too much for me and sometimes I get hungry just an hour or two after the meal. This is something they should definitely pay attention to. When I was young, I wasn’t really into cooking and now I’m sad I didn’t show more interest and learn from my mom, she was such a great cook. Sun Basket has meant so much for me, because now I have to eat and cook healthy and my mom is no longer around to teach me. I’m far from a good cook, but I’ve already learned a lot and the meals I cook with SB are actually tasty. Worth every dime! I was so excited to try Sun Basket. Reviews were good, their website looked good, so I gave it a go! First delivery was disappointing. Everything arrived at room temperature. The ice pack had melted, the salmon smelled funny and the salad was off with a watery brown residue. Huge disappointment. To be fair, Sun Basket gave me a full refund. Delivery number 2. The ice pack although melted, was still chilled. However, the eggs were broken, the yellow pepper had gone bad and the green beans were not there! (Brussel sprouts included by mistake). So I am done. Sad, but I’m not willing to pay $50+ every week for a sub-standard service and product. @ Sun Basket - step up your game if you want to be taken seriously. Didn't like them, tried to cancel and shockingly it didn't take. So we get our near $100 box with only 3 meals!!!!!!!!!! I can feed the two us us all meals all week for that! Also one if the meals was fish which we set to never send us fish, so thanks for that. The vegetarian meal was not good and the 3 of the 5 veggies were not up to standard. She called and they refused to even correct the fish meal even after acknowledging we had marked no fish. What a terrible company. I hope you go bankrupt. Can I give less than one star? I really loved eating hotdogs tonight after making your gross meal. We found 3 verified Sun Basket discounts for April, 2019. 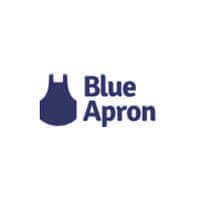 $35 OffFresh organic ingredients and easy recipes delivered, with Paleo, Gluten-free and Vegetarian options. Sign up and we’ll let you know about future Sun Basket promo codes. If you like Sun Basket but aren’t sure whether they are truly the ideal choice for you, you may want to take a look at our comparisons below to discover if one of their competitors is more suitable for you.